The 6th RCEP Inter-sessional Ministerial Meeting (IMM) in Singapore on 12-13 October, 2018. 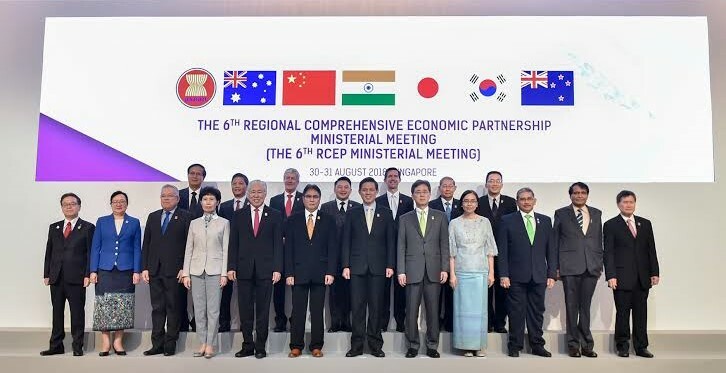 The Ministers from 16 RCEP countries met in Singapore to discuss a modern, comprehensive and mutually beneficial economic partnership agreement among ASEAN and ASEAN's FTA partners. The Indian delegation led by the Minister of State for Commerce & Industry and Consumer Affairs, Food and Public Distribution C. R. Chaudhary. C. R. Chaudhary held bilateral meetings, on the side lines of 6th RCEP IMM, with Trade Minister of Singapore, Assistant Minister for Trade, Tourism & Investment of Australia, Minister of Trade & Export Growth of New Zealand and Vice Minister of China, Wang Shouwen. Singapore sought India's help in early conclusion of RCEP negotiations. Next round meeting of Trade Negotiating Committee (TNC) is scheduled to be held in Auckland, New Zealand, later this month.